This modern refurbished apartment contains one bedroom, sleeping up to 2 people, and is neutrally decorated with soft colours and contemporary furnishings. Based right next to the Mediterranean sea and Barceloneta beach, this apartment is ideally located for weekends in the sun, surrounded by plenty of cafés, bars, restaurants and activities. The open plan living, dining and kitchen area features double glass doors that open out onto a private balcony. A large corner sofa and flat screen television are ideal for evenings in relaxing whilst the kitchen boasts modern fittings including a microwave, large fridge-freezer and stove, so you can prepare your favourite homemade meals to enjoy at the dining table. The bedroom features a large comfortable double bed and built-in wardrobe with floor to ceiling mirrors and stylish décor. A large window means the room benefits from plenty of natural light. The bathroom is equally as high spec , boasting bright spot lighting and a large glass walk-in shower. 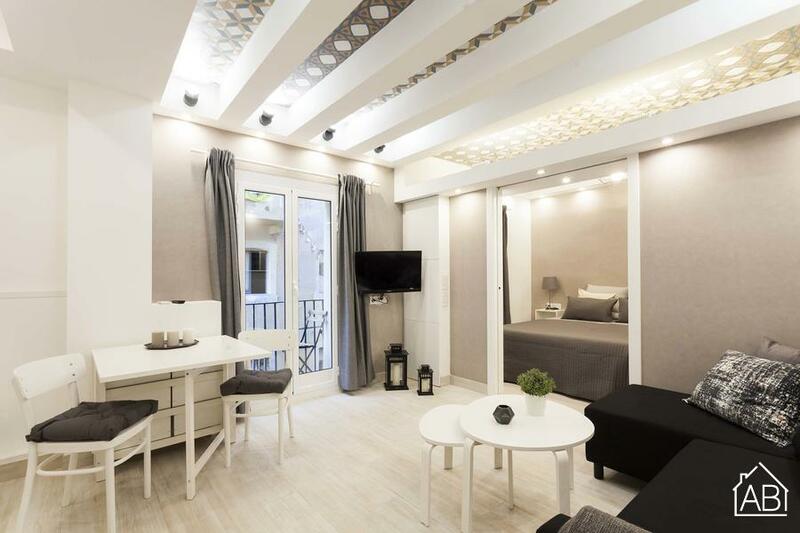 With internet, a washing machine, central heating and air conditioning, this apartment is perfectly equipped for long stays in the Catalan capital.